My wife has a friend named Anne. 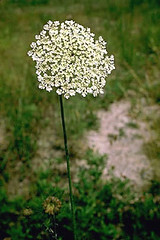 I don't know why, but whenever I hear her name mentioned, I think of the Queen Anne's Lace flower. It is probably just the name, but Anne has been a real God-sent for my wife. She met Anne just at the right time, just in time. They have been a great help to each other, and have become true friends. I have become very thankful for Queen Anne.